How to Install CakePHP on Ubuntu 16.04 LTS? CakePHP is a PHP based open-source web framework. It is used to create dynamic, high-peformance web applications. It is cross-platform and first released on 2005. 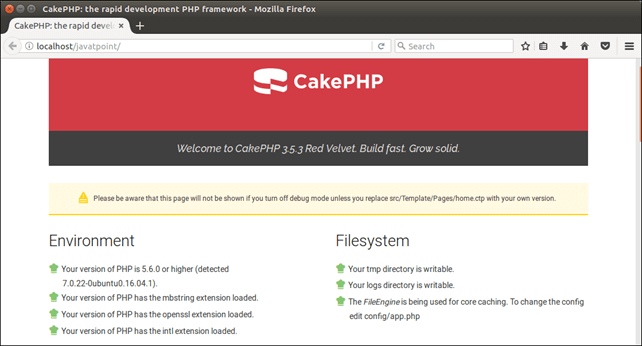 In this tutorial, we will install CakePHP on Ubuntu operating system. It requires following prerequisite. 1) Use the following command to install CakePhp using composer. It will create an application javatpoint inside /var/www/html/ directory, because this is our current directory location. Open server config file using this command. locate to this code inside the config file. Replace it with the following. Enter this command to the terminal, it will enable rewrite mode for apache server. Open browser and type localhost/javatpoint, and it will show the following output to the browser. Well, we have installed and setup CakePHP successfully. Now, build application according to the requirement.